This header file has a generic MAKE macro but due to the complexities it also has a MAKE command for several standard ATmel EEPROMs. You can now read and write bytes to the EEPROM. i2cEEPROM_readByte - Read a single byte from the EEPROM. i2cEEPROM_writeByte - Write a single byte to the EEPROM. i2cEEPROM_readBytes - Read a sequence of bytes from the EEPROM. i2cEEPROM_writeBytes - Write a sequence of bytes to the EEPROM. i2cEEPROM_totalBytes - Returns the total number of bytes in the EEPROM. Read a single byte from the EEPROM. The parameters specify the EEPROM device to read, and the 32 bit address of the byte in the EEPROM that you want to read. Write a single byte to the EEPROM. The parameters specify the EEPROM device, the 32 bit address of the byte in the EEPROM that you want to write, and the value. Note that writes to the EEPROM are relatively slow. So if you are writing a sequence of bytes to an EEPROM then it is faster to use the spiEEPROM_writeBytes command to write them in one go. Read a sequence of bytes from the EEPROM. 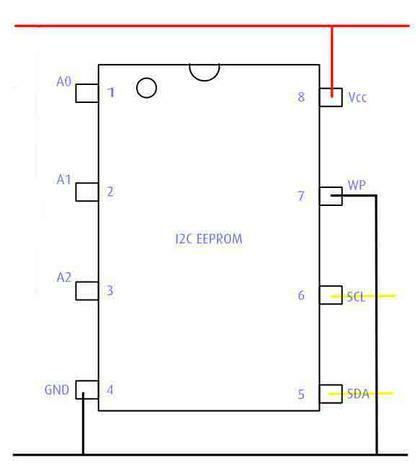 The parameters specify the EEPROM device to read, the 32 bit address of the first byte in the EEPROM that you want to read, the address where you want to read the data to, and the number of bytes to read. Write a sequence of bytes to the EEPROM. The parameters specify the EEPROM device to write to, the 32 bit address of the first byte in the EEPROM that you want to write to, the address where you want to write the data from, and the number of bytes to write. Returns the total number of bytes in the EEPROM.